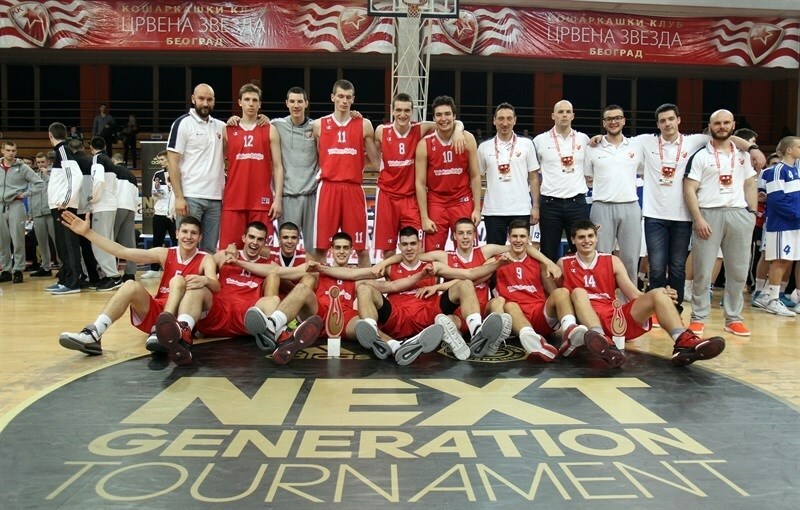 U18 Crvena Zvezda Telekom Belgrade continued its reign over the ADIDAS NEXT GENERATION TOURNAMENT Qualifying Tournament - Marko Ivkovic Belgrade by knocking off U18 Spars Sarajevo 92-88 to clinch its sixth straight title and book its ticket to the ANGT Finals in Berlin. 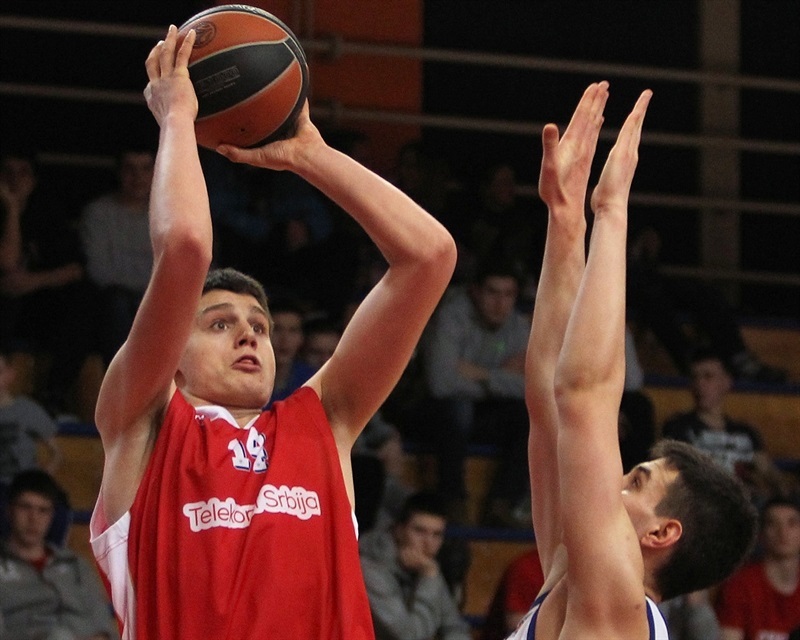 Aleksa Radanov collected 26 points and 8 assists while Borisa Simanic had 16 points, 8 rebounds and 4 blocks as Zvezda increased its winning streak at ANGT Belgrade events to 27 straight games. 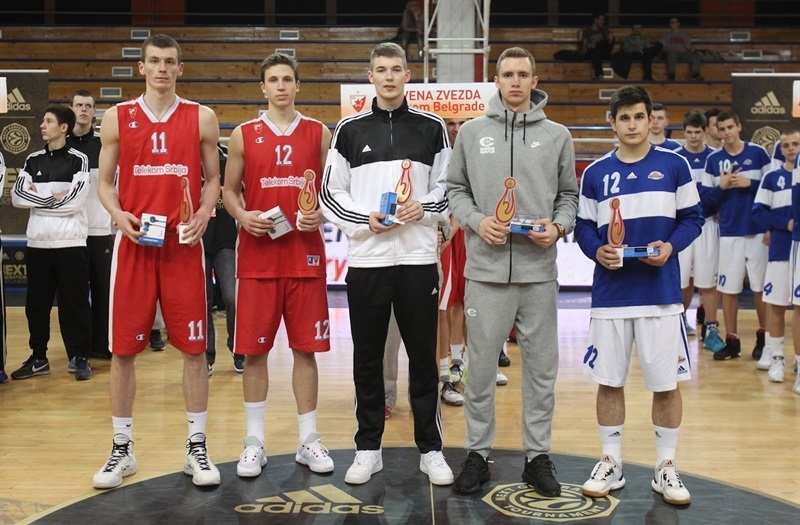 Stefan Djordjevic picked up 13 points, 15 rebounds and 3 blocks while Matija Radovic scored 15 points and Ivan Corovic added 13 points. 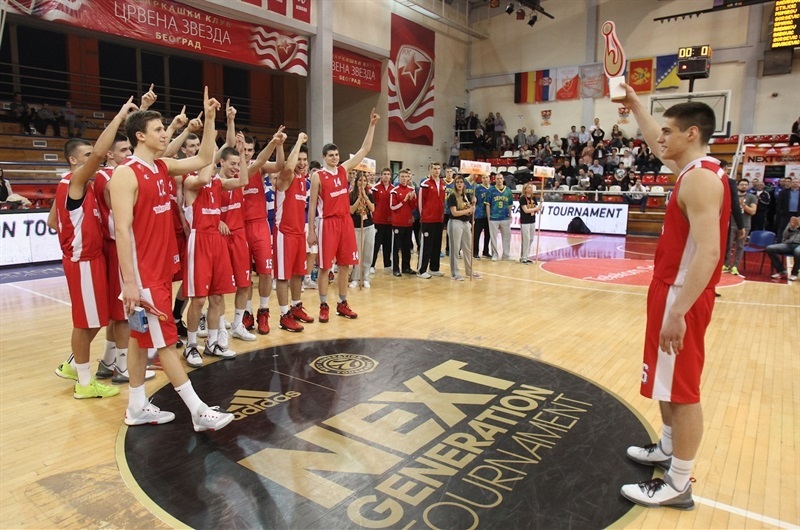 Zvezda became the fourth team to clinch a spot in the ANGT Finals in May in the German capital along with reigning continental champion U18 Real Madrid, U18 Mega Leks Belgrade and U18 Zalgiris Kaunas. 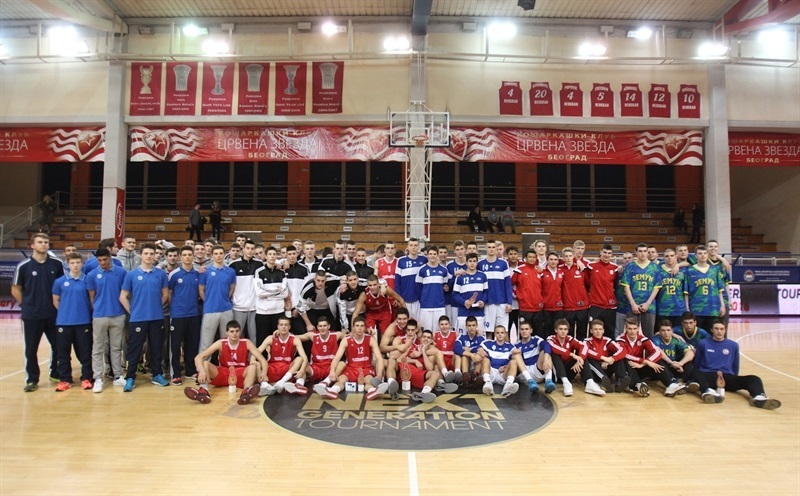 Spars finished second at ANGT Belgrade with Sani Campara scoring 24 points while Amar Gegic picked up 24 points, 10 rebounds, 5 assists and 3 steals. 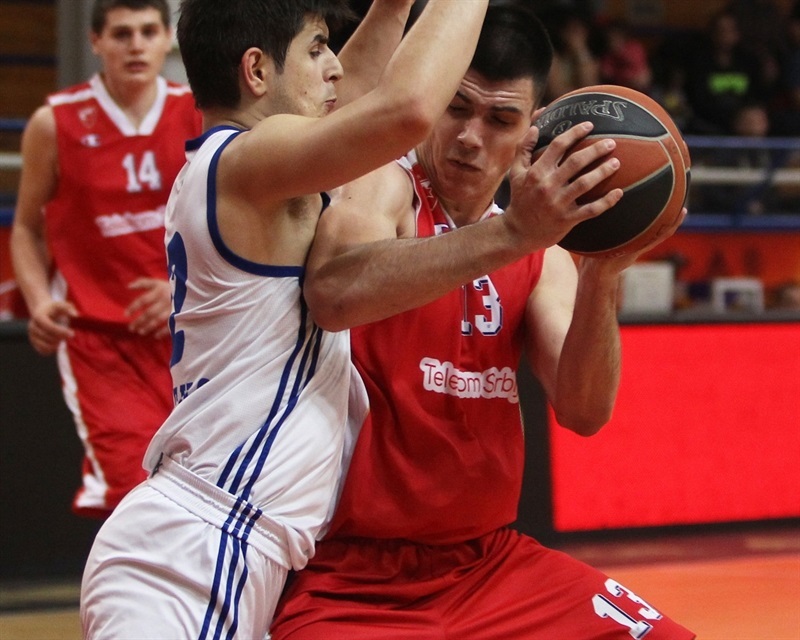 Aleksa Stepanovic chipped in 16 points and 12 rebounds in the loss, and Srdan Kocic scored 13 points. Kocic opened the title game by scoring on Spars’ first possession and Campara came down and buried a triple the next time down to make it 0-5. Corovic’s 2 free throws got Zvezda on the board and his triple knotted it at 5-5. Campara added two more baskets as Spars was up 11-14 before Simanic nailed a three-ball to even things for the third time in the game. And Petar Rebic’s three-pointer gave Zvezda its first lead of the game at 17-16. The lead switched hands on the next four scores with Corovic’s pair of free throws making it 21-20. The game was knotted again after 10 minutes 22-22. Radovic scored 2 early baskets to start the second and Djordjevic’s score gave Zvezda its first bigger lead at 30-24. Campara came up with a big trey at the other end and Amar Tiganj’s free throw made it 34-32. Zvezda continued to get big baskets with a Radanov three-point play. But Spars would not go away as Sandro Antunovic put back an offensive rebound to trim the gap to 40-39. Simanic hit back with another three-ball and Djordjevic’s put-back had Zvezda up 47-41. The gap was 47-42 at intermission. Radanov gave Zvezda a great start to the second half with back-to-back three-pointers and a Simanic free throw had the champs up 54-42. Campara finally put Spars on the board at the 7:10 minute mark, but the team could not cut into the lead as Simanic nailed another triple to put Zvezda up 59-46 and 3 free throws by Radovic helped push the gap to 64-48. Simanic scored couple more baskets to keep Spars at an arm’s length, leading 70-57 after 30 minutes. 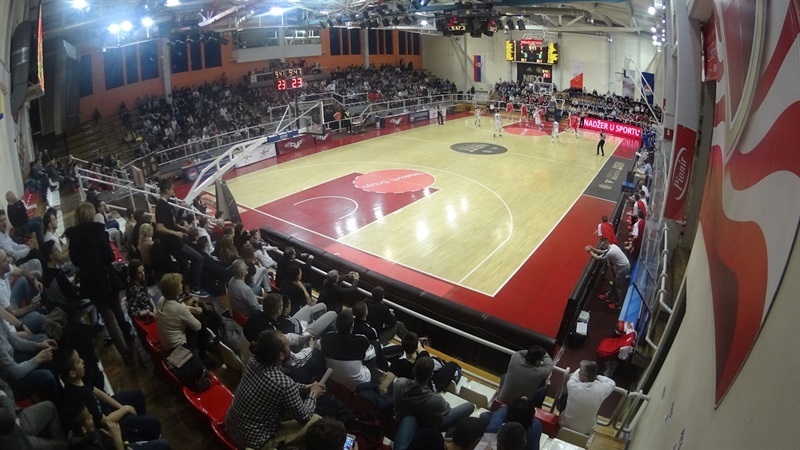 Tarik Biberovic opened the fourth quarter with a three-ball for Spars and Campara got the deficit down to 72-64, resulting in a Zvezda time out with 8 minutes left. Radanov came out of the talk and converted a three-point play and a three-pointer to push the lead to 78-66. Stepanovic got 2 baskets to fall and Gegic added 4 points but the deficit was still 82-74 inside the 4-minute mark before Djordjevic converted a three-point play to make it 85-74. A Campara triple and a pair of Stepanovic free throws got Spars within 85-79 but Radanov drained a three-ball from the right wing and added two free throws for a 90-81 lead with 1:31 minutes remaining. Spars would not go down without a fight with Kocic knocking down a three-ball to make it 90-86 with 40 seconds left. Corovic answered at the other end to get the gap to 92-86, and then Djordjevic blocked Campara’s three-point attempt with 15 seconds to go. Radanov added another block with 8 seconds left to secure the title.